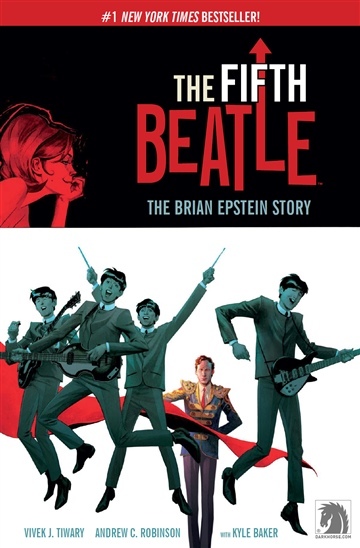 About the Writer: Vivek J. Tiwary is the #1 New York Times bestselling author of The Fifth Beatle: The Brian Epstein Story, a Tony Award-winning Broadway producer and the founder of Tiwary Entertainment Group. Tiwary is currently adapting The Fifth Beatle as a multi-part event series with Sonar Entertainment and will serve as executive producer. On Broadway, Tiwary's productions have won a combined 25 Tony Awards over 44 Tony nominations—every single one of his shows has been decorated. They include such groundbreaking work as Green Day’s “American Idiot,” “A Raisin In The Sun,” and Mel Brooks’ “The Producers”. Tiwary is currently working with Alanis Morissette and Pulitzer and Tony Award-winner Tom Kitt to adapt Morissette’s breakthrough album “Jagged Little Pill” for Broadway. Tiwary’s illustrated Young Adult novel Asha Ascending (with art by the award-winning Sara Richard) is currently being serialized chapter-by-chapter free at AshaAscending.com. About the Artist: Andrew Robinson attended the Savannah College of Art and Design. He’s best known for his cover work on titles like Starman and Hawkman. Robinson has designed covers for many DC Comics titles, variant covers for IDW’s Angel After the Fall and numerous covers for Star Wars. He also has a music project called the Spacejunkies in which he writes lyrics and plays harmonica. About the Artist: Kyle Baker is a New York based cartoonist. He is a multiple Eisner and Harvey Award winner. His work has been published by Marvel Comics, DC Comics, Image Comics and others and includes such titles as Why I Hate Saturn, Plastic Man, and DeadpoolMAX, and Nat Turner.